Congratulations! You have decided to purchase a house, or are thinking about buying one. You'll be joining the ranks of hundreds of families who realize that home ownership offers a number of benefits including building equity, saving for the future, tax advantages, and creating an environment for your family Below are some articles that may help you better understand what steps you need to take to put yourself in the position of buying a new home! You see, when determining your ability to qualify for a mortgage, a lender looks at what is called your "debt-to-income" ratio. A debt-to-income ratio is the percentage of your gross monthly income (before taxes) that you spend on debt. This will include your monthly housing costs, including principal, interest, taxes, insurance, and homeowner’s association fees, if any. It will also include your monthly consumer debt, including credit cards, student loans, installment debt, and car payments. And don't forget, if you have a lot of credit cards even with a zero balance that will count against you. Cancel all of those cards and get written verification that they have been cancelled. How do These Other Debts Affect Your Purchase Price? Even if you feel you can afford the car payment or new furniture, mortgage companies approve your mortgage based on their guidelines, not yours. Do not get discouraged, however. You should still take the time to get pre-qualified by a lender. Remember one thing! Whenever the thought of buying anything enters your mind, think ahead. Think about buying a home first. 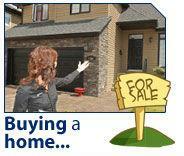 Buying a home is a much more important purchase when considering your future financial well being. BUY YOUR NEW HOME FIRST ! ! ! When a lender reviews your loan package for approval, one of the things they are concerned about is the source of funds for the part of your down payment and closing costs you will be responsible for. (Some cost may be paid by the seller) Most likely, you will be asked to provide statements for the last two or three months on any of your liquid assets. This includes checking accounts, savings accounts, money market funds, certificates of deposit, stock statements, mutual funds, and even your company 401K and retirement accounts. If you have been moving money between accounts during that time, there may be large deposits and withdrawals in some of them. Perhaps you become exasperated at your lender, but they are only doing their job correctly. To ensure quality control and eliminate potential fraud, it is a requirement on most loans to completely document the source of all funds. Moving your money around, even if you are consolidating your funds to make it "easier," could make it more difficult for the lender to properly document. So leave your money where it is until you talk to a loan officer and don’t change banks, either. If you are considering a change to self-employment before buying a new home, don’t do it. Buy the home first. Lenders like to see a two-year track record of self-employment income when approving a loan. Plus, self-employed individuals tend to include a lot of expenses on the Schedule C of their tax returns, especially in the early years of self-employment. While this minimizes your tax obligation to the IRS, it also minimizes your income to qualify for a home loan. If you are considering changing your business from a sole proprietorship to a partnership or corporation, you should also delay that until you purchase your new home.